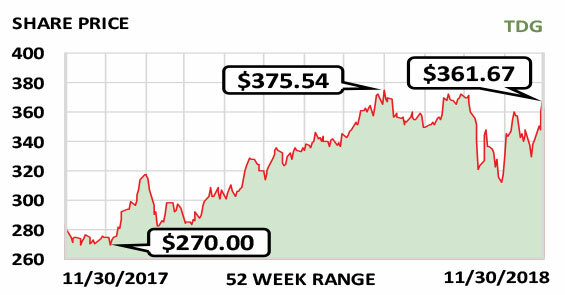 This week’s Stock of the Week supplies important parts to an enormous industry. TransDigm Group Inc. (TDG) is a highly acquisitive company that regularly buys companies that have sole-source proprietary arrangements for supplying airplane parts. This means TransDigm provides a very wide array of aircraft parts ranging from engine igniters to lavatory handles, interior laminates for cabins, batteries, seat belts and much more. TransDigm’s parts are in commercial planes, business jets and defense aircraft. The business model works because once the Federal Aviation Administration or Department of Defense approves a specific part for a specific plane, the maker of that part usually has a monopoly on supplying it for the life of that type of aircraft. TransDigm buys parts makers, integrates their assets quickly into the parent company’s systems, trims costs by reducing facilities and headcount when possible, then raises parts prices. Its main focus is consumables—parts that do not last the life of an aircraft but must be replaced. The headwind is TransDigm’s need to take on debt as a serial acquirer. As interest rates rise, the cost of capital will go up as well. And TransDigm just made its biggest deal ever, paying $4 billion in cash for parts supplier Esterline—making some investors skittish. Absorbing this company may temporarily reduce earnings, but TransDigm is expert at creating substantial value from the firms it buys and is likely to be successful in this acquisition as well. Revenue is likely to continue growing strongly: It was $3.81 billion in fiscal 2018 and will likely be $4.21 billion in fiscal 2019 and $4.46 billion in fiscal 2020. Fiscal year: September. Earnings per share: 2020 est./$18.92…2019 est./$16.57…2018/$17.83. Michael Ciarmoli is director of the capital goods equity research team for SunTrust Robinson Humphrey, Atlanta, a division of SunTrust Banks. He covers companies in the aerospace and defense sector.